About 40 speciesof bats live in the United States and someof these live in the Laurel Lake area. The bat is the only mammal that can fly. Bats have furry bodies with wings covered with smooth skin. Most bats live in caves, attics, or other secluded places. Some varieties of bats live in trees. Bats are nocturnal and prefer dark places. Most bats hang in an upside down position when at rest. Most bats are harmless to humans. It should be noted, however, that bats carry rabies. Bats' diet include large quantities of insects. Bat guano has commercial value as a fertilizer. Bats live in groups or colonies. The size of these groups vary according to species. During the day, bats rest, groom their fur, and tend to their young. Approximately one hour before dusk,bats become active. Bats have been known to live as long as 25 years.They have few predators. Most bats have poor vision. They use a type of radar to navigate and to trap their prey. They emit a series of sounds that echo back to the bat. Some of the sounds are ultrasonic sounds. 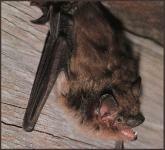 Many bats hibernate or migrate during the winter due to a poorfood supply. Those bats that hibernate, live off of the extra fat they store during the summer. 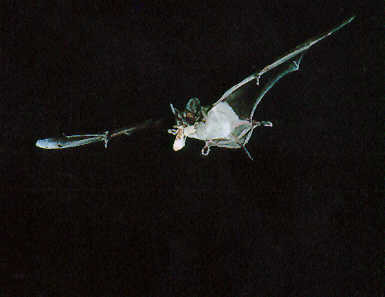 Male and female bats generally occupy different roosts. The mating season lasts only a few weeks and this could occur in spring, fall, or winter depending upon the species. Prior to giving birth, female bats often leave their home colony and enter a nursing colony. Most females give birth to a single baby per year. A newborn bat weighs 20% of the weight of an adult bat. Baby bats cling to their mothers for many weeks and they nurse up to 8 weeks. The major species of bats in the Laurel Lake area are the little brown bats, the big brown bats, and the silver-haired bats.